NORMA JEAN is SHEDDING IN MAY! She hasn’t done this in 10 years! I really think Gina is a miracle worker! 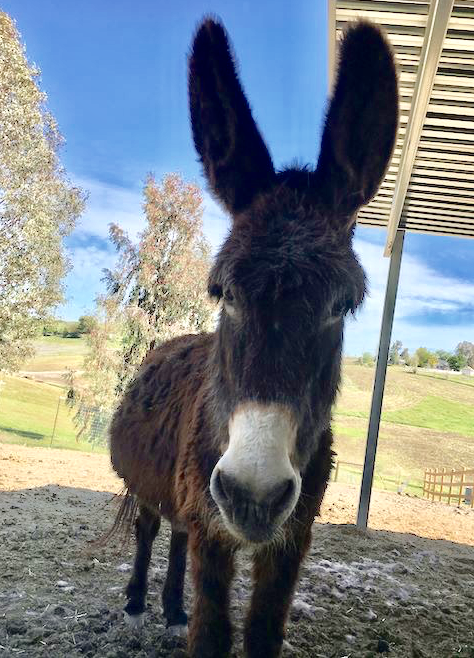 Earlier this month, I told you about Gina Vetro and her homeopathic/ayurvedic remedies that have brought my donkey back from the brink (after 3 vets just said she was “old” – I knew I was losing her). You can read that story here. Soooooooooo, the next hugely big news is that Norma Jean is shedding! SHEDDING! Norma hasn’t shed earlier than August in years. YEARS! They say donkeys don’t get Cushings, but they get Fatty Liver Disease, and there is nothing anyone can do. Well, I am going to say that there IS something you can do… Call Gina! 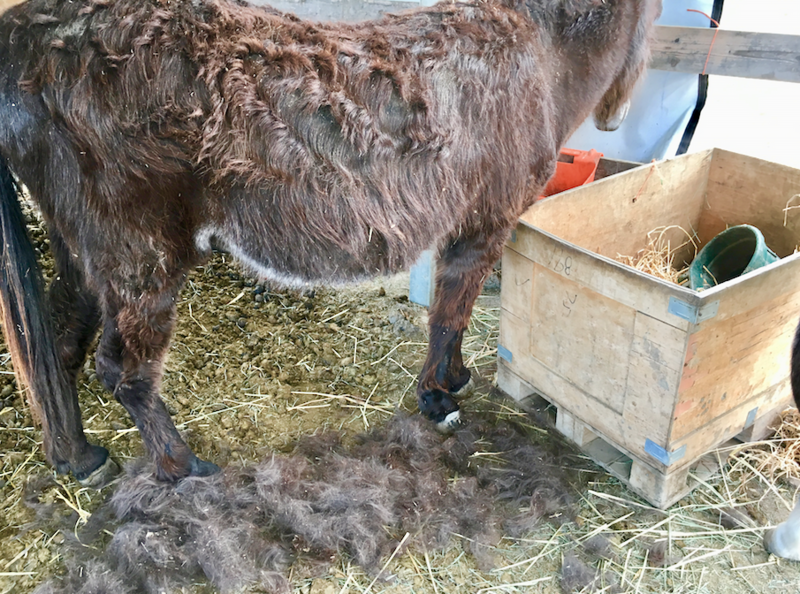 LOOK at how happy and engaged Norma is now… and she is shedding, trotting around, being loving and defiant, giving her opinion and demanding attention – finally – again! Please, if you have a horse that is ‘off’ and you know it. Call Gina! GINA VETRO CONTACT INFO: Gina Vetro, phone: 646-403-7070, email: Gvet13@gmail.com , Click for FB. LOOK AT HER SHED! AND LOOK AT HER SMILE! 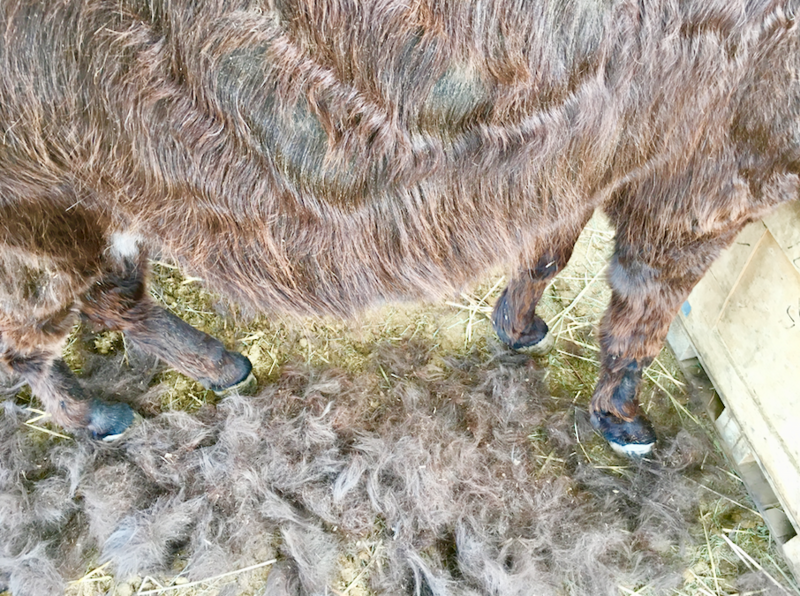 THE FINAL TEST WILL BE HER SUMMER DONKEY PSORIASIS… but even if it comes back, I’m still thrilled with Norma’s surge in health! Norma has gotten donkey psoriasis on her legs every summer for the last 5 summers. I have something that gets rid of it (MAJOR’S SOLUTION/Fungus Free – no affiliation), but it would be great if it didn’t come at all! So, we will see… crossing fingers. “SGT RECKLESS, AMERICA’S WAR HORSE” (THE BOOK) was sitting on my doorstep! Tons of never before seen pics, stories of how the Marine’s loved the little mare, her favorite troopers and her foals…! WHY do I tell myself that it is OK to feed in clothes that I would never, ever, EVER wear in public? !